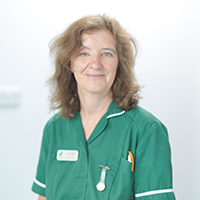 Lucy began her career as a Veterinary Nurse in Nottinghamshire in 1990, qualifying in 1992. She joined Three Rivers Veterinary Group in 2000 having previously worked in Greenwich and Zambia. Her particular areas of interest are animal behaviour and dentistry. She has obtained the BVNA Certificate in both Small Animal Dentistry and Companion Animal Behaviour. She particularly enjoys running the puppy socialisation and training classes. Outside work her hobbies include running, cycling, swimming and taking part in triathlons. She also enjoys walking and bird-watching.